Named after our beautiful daughter, Aisling, the Aisling Art Gallery was opened by Helen Carey, director of the Fire Station Artist Studio, Dublin, in late summer 2015. 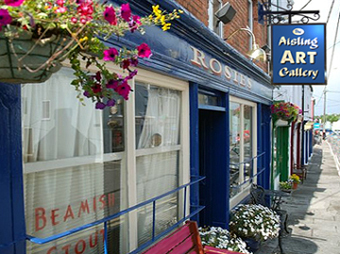 Located in Rosie’s Bar, Ballydehob, in the delightful region of West Cork, it hosts works from a variety of artists. Noel Camier and his wife Christine have been collecting art for over 20 years and the walls of their bar have long been covered in their eclectic collection. The addition of the new space offers visitors an opportunity to further enjoy a wide range of styles and techniques in a pleasing environment. If you would like to enquire about exhibiting please do not hesitate to contact us.